ABSTRACT: The influence of accompanying plants and animal plankton on the growth of Aldrovanda was investigated in a natural habitat and in experimental cultures. The influence of humic acids and temperature on the wintering of turions of plants examined and their development in spring were also determined experimentally. KEY WORDS: Aldrovanda vesiculosa, humic acids, allelopathy, wintering of turions. (1) The effect of organic substances on the development of Aldrovanda, i.e., their role in turions' wintering and in the initiation of plant growth. (2) The allelopathic activity of accompanying plants occurring most frequently with Aldrovanda. Such information would allow to determine with greater precision the best habitats for this plant and factors which decide first of all about its growth and development. This is of great significance in preservative cultivation of Aldrovanda or when transferring it into substitute habitats. The Botanic Garden in Wrocław conducts also such investigations. The present ones were conducted within the Central Programme of Basic Investigation No. 04.05. Chemical analyses of water and plants, and statistical calculations were made using the general methods specified in part I (K a m i ń s k i 1987). For studies on the influence of accompanying plants on A. vesiculosa, locality VII on Lake Miklaszówek was chosen, where it occurred quite abundantly in different plant associations, i.e., Hydrocharitetum morsus-ranae Langendonck 1935 (microhabitat 1), Caricetum rostratae Rübel 1912 (microhabitat 2), Thelypteridii-Phragmitetum Kuiper 1957 (microhabitat 3). In each microhabitat plant samples were taken from three 1.0 m2 experimental areas, each with 30 plants. Biometrical analysis covered the characters showing the best the ecological constitution of the species, i.e., plant length, mean distance between whorls, length of leaves, number of lateral shoots, number of buds, biomass of 100 plants and biotic potential of the population. The experimental material consisted of turions of Aldrovanda collected in autumn from the locality at Nowa Kuźnia (experiment 1) and Lake Miklaszówek (experiments 2, 3) and top plant sections 30 mm long from Lake Kruglak (see part I - Kamiński 1987). E x p e r i m e n t 1. It was conducted between September 20, 1983, and May 26, 1984 to determine the effect of temperature and organic substances on the wintering and development of turions. The organic substance used was an extract of bottom sediments from natural localities of Aldrovanda, in which 90% of carbon is that of humin and fulvic acids, called together humic acids. The experiment was made in two series. In series A turions were placed in aquaria with 10 l of tap water, whereas in series B, about 10000 microg C.l-1 humic acids were added to tap water. Water reaction was determined as pH 6.5 - 7. Plants were measured every 20 days when first growth symptoms were noticed, i.e., from January 25, 1984. The range of the experiment was limited because of lack of sufficient material. Two aquaria from each series, each with 10 turions, were placed in: (1) in a cool chamber at 10°C for 4 months and then in a greenhouse at 10-12°C, (2) in a cold greenhouse at 5 - 8°C in the first period of the experiment and in the following 4 months at 10-12°C, (3) in a greenhouse at 12-15°C and in the final stage of the experiment up to 25°C. E x p e r i m e n t 2. It lasted from October 29, 1984 to January 28, 1985 in order to determine the optimum contents of humin and fulvic acids in the habitat where turions winter. Five Aldrovanda turions were placed in test tubes with tap water containing trace concentrations of these acids - 2000, 4000, 6000, 40000 microg C.l-1 and kept at 4°C. On January 20, 1985 they were moved to room temperature in order to observe the influence of organic substances on plant development. There were three replicas of the experiment. E x p e r i m e n t 3. The effect of organic substance on plant growth in the initial development stage was examined between March 20 and April 15, 1985. It confirmed indirectly the results of experiments 1 and 2. Turions coming to the end of dormant period, i.e., showing no signs of development but chosen from experimental material, in which very few turions began to develop, were used in the experiment. Ten turions (in three series) were placed in each test tube with tap water of a pH about 6, containing 0, 2000, 5000, 10000, 50000, 100000, 150000 microg C of organic substance per 1 litre of water. It was conducted at room temperature and at day light. E x p e r i m e n t 4. 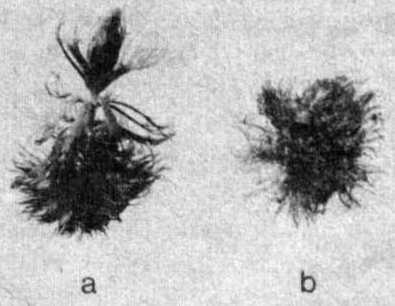 The preliminary experiment (A) between August 12 and September 2, 1986 was followed by the basic experiment (B) determining the influence of most frequently occurring plants on the growth of Aldrovanda. Thirty mm plant tops were placed in glass flasks containing mineral-organic medium (analogous to the basic one in experiment 1 - K a m i ń s k i 1987). Each flask contained (in three replicas) 10 A. vesiculosa plants together with: (a) 5 young Hydrocharis morsus-ranae L. plants, (b) young Stratiotes aloides L. plant, (c) 2 germinant rhizomes of Carex sp. E x p e r i m e n t 5. It was conducted to find out whether accompanying plants or zooplankton in the habitat have a greater influence on the growth of A. vesiculosa. Between June 18 and July 14, 1986, under analogous conditions as in experiment 4 B, into each aquarium with 10 Aldrovanda plants, were added: (a) zooplankton (Daphnia, Cyclops), (b) two germinant rhizomes of Carex sp., (c) plankton and rhizomes together. There were three replicas of the experiment. In order to determine the influence of accompanying plants on the Aldrovanda vesiculosa growth in field investigations, water had to be analysed in particular microhabitats as well as nutrient content in plants examined, individual and group characters of plants had to be measured. The results are given in Tables 1-3.
a Where: * - *** = Fcalculated > Ftabular value of the F Snedecor statistics. Although water was sampled from a relatively small area (about 300 m along the shore) the contents of inorganic and organic substances varied (Table 1). Statistical differentiation was significant but absolute differences were small. The most significant differentiation concerned the contents of sodium, which were the highest in microhabitat 1 (4.83 mg.l-1) and the lowest in microhabitat 3 (3.03 mg.l-1), iron (from 0.39 mg.l-1 in microhabitat 3 to 0.19 mg.l-1 in microhabitats 1 and 2), and sulphates (from 25.2 mg.l-1 in microhabitat 1 to 18.66 mg.l-1 in microhabitat 2). Contents of nitrates, ammonia, phosphates and humic acids were less significantly differentiated. The nitrates were most abundant in water from microhabitat 2 (0.21 mg.l-1) and the least abundant in microhabitat 1 (0.15 mg.l-1). Ammonia nitrogen was the most abundant in microhabitat 2 (1.92 mg.l-1) and the least in microhabitat 1 (0.51 mg.l-1), whereas phosphates were the most abundant in microhabitat 3 (0.061 mg.l-1) and the least in microhabitat 2 (0.033 mg.l-1). The contents of organic humin and fulvic acids were the highest in water of microhabitat 3 (1658 microg C.l-1), and the lowest in microhabitat 2 (852 microg C.l-1). The contents of other inorganic compounds did not differ significantly. Nutrient contents in plants of microhabitats in Lake Miklaszówek varied (Table 2). Phosphorus, sodium and iron contents were most differentiated, nitrogen and potassium contents were less differentiated and calcium and ash contents were the least differentiated. There were no statistically significant differences in magnesium and sulphur contents. Plants from microhabitat 1 had the highest nitrogen and phosphorus contents, and average ones of other elements. Plants from microhabitat 2 had the smallest contents of nitrogen, phosphorus, calcium and magnesium and the highest ones of potassium, sodium and iron. Plants from microhabitat 3 had the highest contents of calcium and magnesium and the smallest contents of potassium and sulphur. Unfortunately the lack of differentiation of potassium and calcium contents and small differentiation of iron and sulphur in particular microhabitats did not confirm the earlier positive correlations between the contents of these macroelements in water and in plants. Table 3 shows individual and group characters of A. vesiculosa population in different plant associations from Lake Miklaszówek. Coenopopulations examined from different plant associations differed significantly in shoot length, length of leaves and biomass. There were less significant differences in the mean length of internodes. As in relations between populations the number of buds in whorls was not very significantly differentiated, there were no differences in populations examined in the number of lateral shoots and biotic potential. 'The best specimens of Aldrovanda were found in microhabitat 2, where it belonged to the association Caricetum rostratae Rűbel 1912. The highest percentage in that association had Carex rostrata Stokes ex Withering, Stratiotes aloides, Hydrocharis morsus ranae and Carex pseudocyperus L.
Worse specimens of Aldrovanda were in microhabitat 3, where they belonged to the association Thelypteridii-Phragmitetum Kuiper 1957. Dominant there were Thelypteris thelypteroides (Michaux fil.) Holub, Carex riparia Curbs, C. rostrata, Stratiotes aloides, Hydrocharis morsus ranae and Typha latifolia L. The worst Aldrovanda specimens were in the association Hydrocharitetum morsus-ranae Langendonck 1935. Hydrocharis morsus- ranae formed there almost monospecific patches. However, there was no explicit answer whether the differences in plant growth in particular microhabitats depended more on accompanying plants or on water chemistry and nutrient contents in plants examined. But the additional multiple correlations between plant length and its contents of particular nutrients obtained earlier (K a m i ń s k i 1987) were true in this case. Table 2. Contents of macroelements in Aldrovanda vesiculosa plants from several microhabitats. For explanation of symbols see Table 1. Table 3. Characteristics of individual and group characters of Aldrovanda vesiculosa from several microhabitats in Lake Miklaszówek. For explanation of symbols see Table I. Experiment 1 confirms more precisely what has been known about the influence of organic substance and temperature on wintering of turions, their development and A. vesiculosa growth (Maisonneuve 1859, Schoenefeld 1860, Ashida 1934, 1935, Sculthorpe 1971, Haldi 1974). Organic substances (humin and fulvic acids) have a double effect on wintering of turions and on plant growth (Table 4). At higher contents of humic acids in water the wintering of turions was worse and plants developed from a smaller number of turions, especially at a higher temperature. Higher contents of humic acids delayed the beginning of the development, but the growth rate of plants was higher, especially at moderate temperature 10-12°C (Fig. 1). The effect of temperature varied according to the development stage of plants. Turions showed small resistance to low temperatures (100% of turions died at temperatures below -10°C) and did not tolerate well those above +12°C. At 20-25°C plants began to develop earlier, their growth rate was higher, but they were subtle, etiolized and poorly. The plants grew the best at 10-12°C in water with higher contents of humic acids. Worse wintering of turions and a delay in their development was recompensed by quick plant growth, their better condition and greater increment of lateral shoots. In aquaria with higher humic acid content some turions fell to the bottom when wintering, whereas in spring they floated towards the surface. This was not observed in aquaria with tap water without additional amounts of organic components. This is an important fact as under natural conditions turions are thus protected against freezing and vegetative reproduction of A. vesiculosa is continued. Fig. 1. The effect of humic acids and temperature on the growth of Aldrovanda vesiculosa in a culture in vitro. Table 4. Influence of humic acids and temperature on wintering and development of Aldrovanda vesiculosa turions cultured in vitro (experiment I). A - no humic acids added, B - with humic acids added. The object of this experiment was to determine the optimum concentration of humic acids for the wintering of Aldrovanda vesiculosa turions. Table 5 gives the results. With increasing humic acid concentrations in water at 0-4°C the number of turions falling to the bottom increased (Fig. 2). The longer the experiment the more it is visible. On January 28, 1985 (first symptoms of turion development) test-tubes with turions were moved into room temperature (about 18°C). After a week later the development of turions from lower humic acid concentrations was the quickest. At humic acid concentration of 40000 microg C.l-1 of water, turions showed no development symptoms. On the 108th day of the experiment, and after 26 days of higher temperature all plants, independently of the concentration of humic acids in water, attained the same length of 3 cm. The number of turions from which the plants developed varied according to concentrations of humic acids; the higher the concentration the more turions died. At a concentration of 40000 microg C.l-1 water 89.4% turions died. Fig. 2. The effect of humic acids on Aldrovanda vesiculosa turion fall during wintering in culture in vitro (experiment 2, photograph taken on January 20, 1985). Concentrations of humic acids: a - traces, b - 2000, c - 4000, d - 6000, e - 40000 microg C.l-1 water. Table 5. Influence of humic acids on Aldrovanda vesiculosa turions fall at the bottom in the wintering period (experiment 2). Considering the number of turions which started to develop after the dormant period and the fact that they fell to the bottom, it can be said that turions wintered the best at concentration of humic acids in water 6000 microg C .l-1. Similar results were obtained in each series confirming the conclusions from experiments 1 and 2 and leaving no doubt as to the influence of organic matter on plant growth. Excessive concentration of humic acids had a negative effect - the plants did not grow well and leaves had an anomalous shape, especially in the initial stage (Fig. 4). It is also interesting that all plants grow at 150000 microg C.l-1, i.e., about 130000 microg C of humic acids per litre, whereas the majority of turions cannot develop any longer at humic acid concentration exceeding 40000 microg C.l-1 medium. Fig. 3. The effect of humic acids on the growth of Aldrovanda vesiculosa in culture in vitro (experiment 3, photograph taken on March 3, 1985, 10 days after the beginning of the experiment). Concentrations of humic acids: a - traces, b - 2000, c - 5000, d - 10000, e - 50000, f - 100000, g - 150000 microg C.l-1 water. Fig. 4. Morphological changes of young Aldrovanda vesiculosa plants developing from turions under the influence of humic acids in concentrations: a - 10000, b - 100000 microg C.l-1 water. The allelopathic effect of accompanying plants on the growth of A. vesiculosa has been confirmed in experiment 4 and Table 6 presents the results: A - of preliminary experiment (15 days) with 1 replica, B - of proper experiment. All accompanying plants influence the growth of Aldrovanda to a different degree. Plants in the company of Carex sp. were the longest, then those with Stratiotes aloides, whereas plants growing in the company of Hydrocharis morsus-ranae were the shortest. This was also confirmed by the increment of lateral shoots. The preliminary experiment (part A) provided approximate data. It is difficult to say whether A. vesiculosa plants grow well in the company of Typha latifolia and Phragmites australis (Cavanilles) Trinius ex Steudel and have bigger traps due to allelopathy or as a result of decreasing pH of the medium by these plants. Plants cultivated with Carex sp. and Stratiotes aloides differed distinctly in their morphology. Plants growing with S. aloides were thicker, had a higher biomass and more lateral shoots. Control plants were the least attractive ones. Table 6. Influence of accompanying plants on Aldrovanda vesiculosa growth under tissue culture conditions (experiment 4 A, B). For explanation of symbols see Table 1. L., Typha latifolia, Carex sp. As there is a strong influence of accompanying plants on the growth of A. vesiculosa, the effect of zooplankton had to be analysed. The investigations showed a favourable effect of zooplankton on the growth of plants. Both the influence of accompanying sedges and of zooplankton was greater than of zooplankton or sedges separately (Table 7). This proved a positive allelopathic activity of sedges and other accompanying plants such as Stratiotes aloides and Hydrocharis morsus-ranae. Table 7. Influence of zooplankton and accompanying plants on growth of Aldrovanda vesiculosa cultured in vitro (experiment 5). For explanation of symbols see Table 1. 3 Aldrovanda + rhizomes of Carex sp. Biotic factors are important in plants life. These are interactions between plants and between plants and animals, and especially plants from the family Droseraceae. This has been studied because of reports suggesting that otherwise than bladdewort (Utricularia) Aldrovanda cannot grow without organic matter and microfauna in the habitat. Sculthorpe (1971) has mentioned after Lloyd that Schenck and Cramer kept Aldrovanda for 2 years in an inorganic habitat, but A s h i d a (1934, 1937) could not cause its growth in a solution of mineral salts and only the addition of organic remains of macrohydrophytes, among which Aldrovanda grows in a natural habitat, resulted in its good growth. K i y o m i c h i (1974), M a z r i m a s (1974), Ohtaki and Katagiri (1974), who have cultivated Aldrovanda are of the same opinion. They have also noticed its better growth when provided with microorganisms and accompanied by live plants, the same as in a natural habitat. This has been confirmed by the experiments. Aldrovanda did not grow in a solution of mineral salts, whereas an addition of organic matter extracted from bottom sediments from a natural habitat resulted in a relatively good growth (K a m i ń s k i 1987). The phenomenon of turion fall depending on the contents of organic matter in water is confirmed by Hausleutner (1850), Schoenefeld (1860) and H a 1 d i (1974). According to S c h o e n e f e 1 d (1860) turions in aquaria with sandy substrate float on the water surface till development, whereas according to the other two authors the addition of silt to the aquarium is responsible for turion fall to the bottom. There is no doubt as to the higher accumulation of organic bottom silt (sapropel, gyttia) with the increasing eutrophication of lakes, thus increasing the humic acid content in water. A hypothesis can be presented about the decisive effect of humic acid content in water on turions fall. It has been confirmed in experiment 2 with a positive relation between the number of turions falling in winter and the humic acid content in water (Table 5, Fig. 2). Lakes are vertically differentiated as to humic acid content in water. Their highest concentrations are in near bottom layers, sometimes even 5 times higher than in the near-surface layers. Woticew (after J a k u b o w s k a 1968) has shown great differences in the near-surface layers over the year; maximum concentrations in spring and autumn during the mixing of water. Higher humic acid content in near-surface layer in autumn may cause the falling of turions even in lakes having low humic acid content in the same layer in summer. This requires further investigations. Considering the number of turions that fell and of "germinant" ones it can be said that they winter best at 6000-7000 microg C of humic acids per litre of water. This is also the optimum content for the growth of Aldrovanda. Experiments 1, 2, 3 showed that as humic acid content increased to the optimum, the development rate of plants increased as expressed by length increment. Interesting, but difficult to explain is the simultaneous opposite effect, delay of the beginning of plant growth (Fig. 1, Table 5). This phenomenon may be important for plants, especially at low water levels and spring ground frosts. Also the turions are not very resistant to low temperatures. K u t t (1975), on the other hand, is of an opinion that turions can remain frozen at some -4°C for 4-5 months without being damaged. Although quick freezing of turions (2 days) at -2°C in experiment 2 did not affect their development in spring, a longer period of lower temperature to -10°C caused the death of all turions. In some habitats the water depth between tussocks of sedges growing on floating turf varied from 0 to 50 cm. Aldrovanda populations were not abundant there. F i j a ł k o w s k i (1958b) has also observed a lack or low frequency of Aldrovanda in hollows of the turf formed when water bodies are being overgrown. Perhaps water in these microhabitats freezes entirely, and during severe or snowless winters the temperature where turions winter drops below -10°C causing the disappearance of the population. Habitats of Aldrovanda are generally sheltered, shallow little bays about 1 m deep, where water is quite warm in summer and never freezes to the bottom in winter. Humic acids in water control the turion fall to the bottom. Probably the too low content of humic acids and temperature explain the absence of Aldrovanda in quiet spots of sandy shores even when the rushes are dense and coenotic relations and water chemistry are quite suitable for this plant. A too high temperature also affects negatively the wintering turions. Turions kept at 12°C show worse development (experiment 1). This has been confirmed by earlier observations of Hausleutner (1850) and Ohtaki and Katagiri (1974) about the unfavourable effect of higher temperature (over 25°C) on the growth and development of A. vesiculosa. This intensive growth results in delicate plants extremely sensitive to unfavourable environmental factors. As shown by C z a j a (1924), below 10°C the prehensile properties of Aldrovanda traps no longer work, whereas a temperature increase over 40-45°C may cause the traps to close slowly automatically (in 2-50 sec.). Mechanical irritation and rapid temperature changes prolong the time of closing the traps. According to M a z r i m a s (1978) Aldrovanda stops growing below 16°C, the optimum being 23-25°C, whereas according to my observations the best growth of Aldrovanda is at 15-20°C. But these differences are probably due to the fact that M a z r i m a s (1978) in his experiments used Aldrovanda from warmer climatic zones, where it grows without having a dormant stage. Light intensity is very important for plant growth. But in case of Aldrovanda there is a controversy. Although W e n d t (1952) and H a 1 d i (1974) describe Aldrovanda as a photophilous plant, my observations and those of H a u s 1 e u t n e r (1850) and Mazrimas (1974) indicate that it grows better in semi-shade (about 50-70% of full light) than directly in the sun. I have tried to estimate the influence of accompanying plants on A. vesiculosa growth on the basis of Aldrovanda measurements in plant associations varying as to the abundance of accompanying plants (Lake Miklaszówek). This suggested only the positive effect of accompanying plants, because according to correlations observed, the chemistry of microhabitats examined affected also significantly the plant growth (Tables 1-3). Experiments in cultures in vitro indicated a high and differentiated influence of accompanying plants on growth, number of shoots and biomass of Aldrovanda (experiment 4). The length increment of Aldrovanda shoots was stimulated the most by sedges, whereas Stratiotes aloides affecting less the length of shoots caused an increase in their numbers and higher plant biomass. Hydrocharis morsus-ranae had the weakest biotic influence on Aldrovanda. But A. vesiculosa has a broad phytosociological amplitude. This was also indicated by earlier investigations of F i j a ł k o w s k i (1985a, 1985b) and fragmentary descriptions of European habitats (C a s p a r y 1859, 1862, M o e s z 1907, Borhidii, Jarai-Komlodi after Hegi (1961) and tropical zones (Sculthorpe 1971, Hutchinson 1975). Results of experiment 5 show positive influence of zooplankton on the growth of Aldrovanda, almost as positive as that of accompanying Carex sp. and these two factors have a double effect. Thus without contradicting that the evolutional adaptation of Aldrovanda to habitats not abundant in nitrogen, phosphorus and some microelements, takes the form of catching and digestion of microorganisms (Schmucker and Linneman 1959, Sculthorpe 1971, Gumiński 1977), one may present a hypothesis that allopathic effect of accompanying plants takes the form of supplying Aldrovanda with biotically active organic substance, which Aldrovanda cannot synthetize but is one of the links of the metabolic chain. This substance may be also obtained from microorganisms caught and in small amounts from decomposing plant remains. These may be growth controls such as phytohormones, vitamins (more likely) or amino acids. (1) Proper contents of organic substances in water and especially of humic acids (optimum 6000-7000 microg C.l-1 water) are very important for the growth, development and wintering of Aldrovanda vesiculosa. (2) Accompanying plants have a positive effect on the growth of Aldrovanda, but the intensity of growth depends on the species composition of the community in which it occurs. (3) Positive allelopathic effect of plants accompanying Aldrovanda, such as Carex sp., Stratiotes aloides, Hydrocharis morsus-ranae, depends probably on providing it with biotically active organic substances, which Aldrovanda cannot synthetize as proved by the impossibility of cultivating it on an inorganic medium. Furthermore, the substance indispensable for the growth of A. vesiculosa is released in small amounts during the mineralization of organic substance and is assimilated by the plant when digesting the organisms in traps. Studies in natural localities, and mainly in experimental cultures, have shown a significant influence of zooplankton and accompanying plants on Aldrovanda vesiculosa growth. The influence of plants varies as well as its intensity for particular species (Table 6). The length increment is caused mainly by sedges and Stratiotes aloides, which also increases the number of shoots of Aldrovanda plants. Rush species such as Typha latifolia and Phragmites australis cause a considerable increase in the size of traps. Zooplankton has a positive effect resembling that of sedges, and the joint effect of plants and zooplankton is much stronger (Table 7). It is assumed that the allelopathic effect of accompanying plants depends on providing Aldrovanda with biologically active organic substance, which the plant cannot synthetize, and is one of the links of metabolic chain. This substance can be also obtained from microorganisms caught and decomposing plant remains. These may be growth controls such as vitamins or amino acids. This is indirectly proved by the inability to cultivate Aldrovanda in a purely mineral habitat. Experiments 1, 2, 3 have shown that an appropriate concentration of humic acids, optimum 4000-7000 microg C.l-1 water, is an important factor (Table 5, Figs. 2-4). They accelerate plant growth, increase its biotic potential and control turion fall to the bottom of water body in autumn. This is indispensable as A. vesiculosa turions are not resistant to low temperatures. Also a too high temperature affects negatively the wintering of turions, decreasing their ability to develop in the vegetation period (Table 4). This of course is true for plants from temperate zone as in sub- and tropical climates Aldrovanda does not have such a distinct dormant stage and grows all year round. Przeprowadzone badania na stanowiskach naturalnych, a przede wszystkim w kulturach eksperymentalnych, wykazały istotny wpływ zooplanktonu i roślin towarzyszących na wzrost Aldrovanda vesiculosa. Oddziaływanie roślin jest niejednakowe, a jego intensywność jest różna dla poszczególnych gatunków (tab. 6). Najsilniej na wzrost wydłużeniowy oddziałują turzyce i Stratiotes aloides, który powoduje także lepsze rozgałęzienie się roślin Aldrovanda. Gatunki szuwarowe, takie jak Typha latifolia i Phragmites australis, powodują dość znaczne zwiększenie rozmiarów pęcherzyków chwytnych. Pozytywny wpływ zooplanktonu jest zbliżony do wpływu turzyc. Łączne oddziaływanie roślin i zooplanktonu jest jeszcze silniejsze (tab. 7). Istnieje domniemanie, że allelopatyczne oddziaływanie roślin towarzyszących polega na dostarczaniu dla Aldrovanda biologicznie czynnej substancji organicznej, której nie potrafi ona syntetyzować, będącej jednym z ogniw łańcucha przemian metabolicznych. Substancja ta może być także uzyskiwana ze schwytanych mikroorganizmów oraz w niewielkich ilościach z rozkładających się szczątków roślinnych. Mogą to być regulatory wzrostu typu witamin bądź aminokwasy. Pośrednim dowodem na to jest niemożność utrzymania Aldrovanda przy życiu w środowisku czysto mineralnym. Doświadczenia 1, 2, 3 wykazały, że ważnym czynnikiem jest odpowiednie stężenie kwasów humusowych, których optymalna zawartość wynosi 4-7 tys. microg C.l-1 wody (tab. 5, rys. 2-4). Przyspieszają one wzrost roślin, zwiększają ich potencjał biotyczny oraz regulują proces opadania turionów na dno zbiornika wodnego w okresie jesiennym. Jest to nieodzowne, ponieważ turiony A. vesiculosa nie są odporne na niskie temperatury. Także zbyt wysoka temperatura niekorzystnie wpływa na zimowanie turionów, efektem czego jest obniżenie ich zdolności rozwoju w okresie wegetacyjnym (tab. 4). Oczywiście, powyższe stwierdzenia dotyczą roślin zaaklimatyzowanych w strefie umiarkowanej, ponieważ w kómacie sub- i tropikalnym Aldrovanda nie przechodzi tak wyraźnej fazy spoczynku i jej wzrost trwa przez cały rok. 1. A s h i d a J. 1934 - Studies on the leaf movement of Aldrovanda vesiculosa L. I. Process and mechanism of the movement - Mem. Coll. Sci. Kyoto Univ., ser. B, 9: 141-244. 2. A s h i d a J. 1935 - Studies on the leaf movement of Aldrovanda vesiculosa L. II. Effects of mechanical, electrical, thermal, osmotic and chemical influences - Mem. Coll. Sci. Kyoto Univ., ser. B, 11: 55-113. 3. A s h i d a J. 1937 - Studies on the leaf movement of Aldrovanda vesiculosa L. III. Reaction time in relation to temperature - Bot. Mag., Tokyo, 51: 505-513. 4. C a s p a r y R. 1859 - Aldrovanda vesiculosa Monti. - Bot. Zeitung, Vol. 17, Nos. 13, 14, 15, 16: 117-150. 5. C a s p a r y R. 1862 - Aldrovanda vesiculosa Monti. - Bot. Zeitung, Vol. 20, Nos. 24, 25, 26: 185-206. 6. C z a j a A. T. 1924 - Reizphysiologie Untersuchungen an Aldrovandia vesiculosa L. – Pflűgers Archiv fűr die gesamte Physiologie, 206: 635-658. 7. F i j a ł k o w s k i D. 1958a - Obserwacje nad ekologią i rozmieszczeniem wierzby borówkolistnej (Salix myrtilloides L.) na Pojezierzu Łęczyńsko-Włodawskim [Observations on the ecology and distribution of Salix myrtilloides L. in the Łęczna-Włodawa Lake District] - Acta Soc. Bot. Pol. 27: 605-612. 8. F i j a ł k o w s k i D. 1958b - Badania nad rozmieszczeniem i ekologią aldrowandy pęcherzykowa­tej (Aldrovanda vesiculosa L.) na Pojezierzu Łęczyńsko-Włodawskim [Studies on the distribution and ecology of Aldrovanda vesiculosa L. in the Łęczna-Włodawa Lake District] - Acta Soc. Bot. Pol. 27: 597-604. 9. G u m i ń s k i S. 1977 - Ogólna fizjologia roślin [General plant physiology] - Państwowe Wydawnictwo Naukowe, Warszawa, 449 pp. 10. H a l d i J. 1974 - Culture of Aldrovanda - Carnivor. Pl. Newslet. 3: 28-29. 11. H a u s l e u t n e r, 1850 - Cultur der Aldrovanda - Bot. Zeitung, Vol. 8, No. 32: 600, No. 47: 831-832. 12. H e g i G. 1961 - Illustrierte Flora von Mittel Europa - Carl Hanser Verlag, Műnchen, Band IV/2 Teil, Teilband A: 497-1112. 13. H u t c h i n s o n G. E. 1975 - A treatise on limnology. Vol. III. Limnological botany - A. Wiley Intersc. Public., New York-London-Sydney-Toronto, 660 pp. 14. J a k u b o w s k a L. 1968 - Kwasy tłuszczowe w wodach Jeziora Zegrzyńskiego [Fatty acids in waters of Lake Zegrzyńskie] - Prace Inst. Gosp. wod. 5: 83-111. 15. K a m i ń s k i R. 1987 - Studies on the ecology of Aldrovanda vesiculosa L. I. Ecological differentiation of A. vesiculosa population under the influence of chemical factors in the habitat – Ekol. Pol. 35: 559-590. 16. K i y o m i c h i H. 1974 - Growing Aldrovanda - Carniv. Pl. Newslet. 3: 28. 17. K u t t D. 1975 - Aldrovanda - Carniv. Pl. Newslet. 4: 56. 18. M a i s o n n e u v e D. 1859 - Aldrovandia - Bull. Soc. Bot. Fr. 6: 399-401. 19. M a z r i m a s J. 1974 - Further hints on growing Aldrowanda - Carniv. Pl. Newslet. 3: 27-28. 20. M a z r i m a s J. 1978 - Beginner's Corner, Aldrovanda - Carniv. Pl. Newslet. 7: 51-52. 21. M o e s z G. 1907 - Adatok on Aldrovanda vesiculosa L. ismerte her - Ann. Hist. Nat. Mus. Hung. 5: 324-399. 22. O h t a k i, K a t a g i r i, 1974 - How to grow Aldrovanda vesiculosa - Carniv. Pl. Newslet. 3: 10-11. 23. S c h m u c k e r T., L i n n e m a n G. 1959 - Carnivorie (In: Handbuch der Pflanzenphysiologie, Bd. XI, Heterotropie, Ed. W. Ruhland) - Springer-Verlag, Berlin-Gőttingen-Heidelberg, 198-283. 24. S c h o e n e f e l d W. 1860 - Sur le mode de vegetation de Aldrovanda vesiculosa en hiver et au printemps - Bull. Soc. Bot. Fr. 7: 389-392. 25. S c u 1 t h o r p e C. D. 1971 - The biology of aquatic vascular plants - Edward Arnold, London, 610 pp. 26. W e n d t A. 1952-1958 - Die Aquarienpflanzen in Wort und Bild - Alfred Kernen Verlag, Stuttgart, 338 pp.